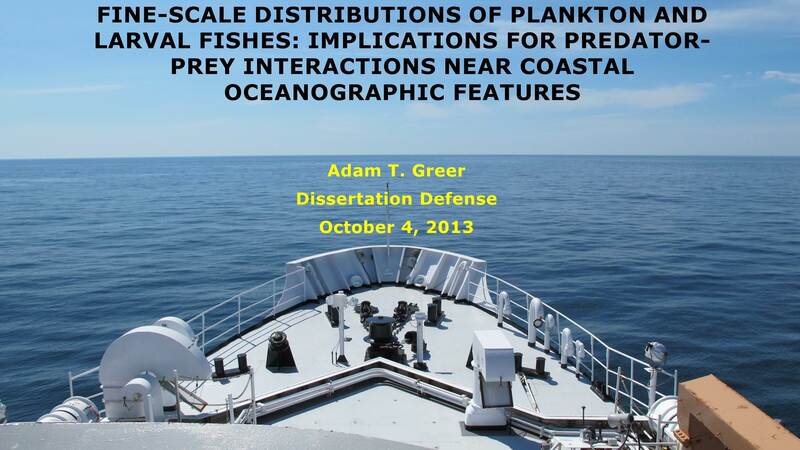 Congratulations to Dr. Adam Greer! In our Ph.D. dissertation defenses, we give a 1-hr talk on our research (imagine trying to cram in 5+ years of work into 1 hour!) and then we have a closed-door session with our Ph.D. committee where we answer questions and ‘defend’ our research. Adam did fabulously on Friday and successfully defended! He will be finishing the writing this month and then moving to on as a Post-doctoral researcher at the University of Georgia. Congratulations, Dr. Greer! This entry was posted in Science and tagged adam greer, dissertation, fine scale, plankton by jessicaluo. Bookmark the permalink. CONGRATULATIONS, DR. GREER! The title of your dissertation makes me want to learn more. What did you conclude from your research? Were you able to use anything from Plankton Portal, or is it too recent to have played a part? No, I did not use anything from Plankton Portal, but it would have been awesome to have! The main conclusion was that many planktonic organisms tended to aggregate in layers of 5-10 m, so ~90% of the biomass was typically confined to discrete layers of plankton. This applied to jellies, copepods, and even fish larvae in diverse oceanographic environments. Thanks for your interest! Hey, congratulations, Dr. Greer! I wish you lots of success in your work! Thanks for your support, Maggie. We hope your are enjoying the Plankton Portal!